The Sleep Safe Bed Rail gives you the support that you need. It offers stability while standing, and can be extended to prevent night time falls. The rail extends and locks in place at 26, 34 and 42 inches. It easily pivots down and out of the way when not in use. This bed rail is both attractive and functional. Four main features include. It is a half bed rail that extends in length for fall protection at night. The rail pivots 180 degrees down and out of the way when not in use. The designer leather-like organizer pouch keeps items handy and doesn't spill when rail pivots down. 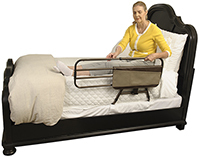 A strong safety strap secures the rail to the bed frame to ensure that it will not move out of position. 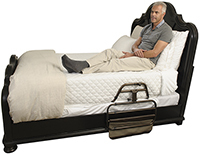 One of the upgraded features of this product is that it can be adjusted to fit mattress heights of 12 - 18 inches. The product only weighs 12 pounds but it can support up to 300 pounds. This product is listed with no price since it can only be purchased in our store. Do no add it to your cart.